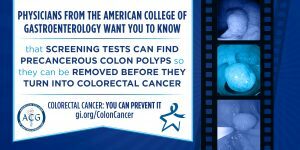 A new study from the Centers for Disease Control and Prevention (CDC) that was published in Preventing Chronic Disease reported that although colorectal cancer screening rates have increased, these screenings are are still below CDC targets. The researchers analyzed data on cancer screening rates for breast, cervical, colorectal and prostate from the National Health Interview Survey that was conducted by the Census Bureau for 2000 through 2015, comparing the targets set by the CDC’s Healthy People 2020 goals. Adjusted findings for 2015, compared with previous years, show persistent screening disparities, particularly among the uninsured, and progress for colorectal cancer screening only. 1. Compared to the other types of cancer included in the study, only colorectal cancer screening rates increased from 2000-2015. Among women aged 50 to 75 years old, 63.4% reported a recent colorectal screening test — for men it was 61.9%. But these screening rates are still below target, as CDC’s goal for 2020 is 70%. 2. Researchers found disparities in prevalence of test use among subgroups for all tests examined. People who are less likely to undergo screening for colorectal and the other types of cancers include those who have had no contact with a doctor in the past year, no usual source of health care, and no insurance coverage. 3. Understanding use of cancer screening tests among different population subgroups is vital for planning public health interventions with potential to increase screening uptake and reduce disparities in cancer morbidity and mortality. The American College of Gastroenterology recommends that all normal-risk individuals undergo colonoscopy beginning at age 50, and age 45 for African Americans. But if you have a family history of colorectal cancer— especially in a first-degree relative, such as a parent, sibling or child—your physician may recommend earlier or more frequent screening. You should also talk with your doctor if you notice any unusual symptoms, such as rectal bleeding or a change in bowel habits. Risk factors for colorectal cancer include age (the majority of patients are 50 or older). But other risk factors include having been diagnosed with inflammatory bowel disease, such as Crohn’s or ulcerative colitis; a family history of colorectal cancer; or a genetic predisposition to colorectal cancer showing up as such syndromes as familial adenomatous polyposis or Lynch syndrome. You’re also at greater risk if you eat a low-fiber, high-fat diet, are obese, use tobacco, drink alcohol, eat few fruits or vegetables, and have a sedentary lifestyle. A change in typical bowel habits, constipation, diarrhea.